In stock - low quantity. Order in the next 14 hours, 47 minutes and it will go out today! 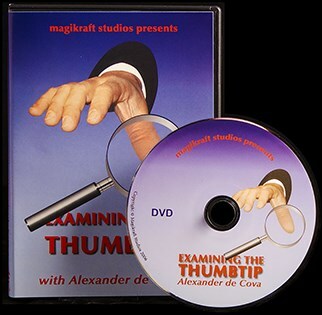 "I have persuaded Bavarian magician Alexander de Cova to finally release his work on the thumbtip. This is like nothing you have ever seen before. I promise his innovative handling of this tool will astound you." In this presentation for platform or stage a romantic prediction leaves the audience both mystified and charmed. Great fun as a spectator tries to draw your portrait, only to find the artwork vanishes from under their nose! A prescription for mystery. This bill to sealed bottle is so beautifully crafted it will make you want to do it just for the sheer pleasure.